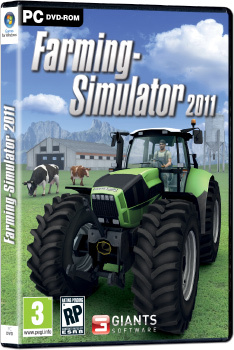 Thanks to Brian for pointing out this mildly hilarious post about a demo of Farming-Simulator 2011. After reading it, I had to know… was this for real? Was the RPS guy pulling my leg? So I went to the web site. Practically the first thing I noticed was the excited dictate “Take control of many authentic machines!”, which sounds like it came from the desk of a mad scientist qua artificial intelligence guru. Apparently, the F-S 2011 machines aren’t just any old harvesters or balers: “Thanks to the licensing of machinery from leading manufacturers like DEUTZ-FAHR, KRONE, HORSCH, PÖTTINGER and VOGEL & NOOT you are able to control authentic farming equipment.” Woohoo? But imagine my delight when I came across this “feature” in the game description (ignore the comical effect of the lack of punctuation): “Now it’s possible to breed cattle completing a variety of tasks such as feeding the cows or spreading the dung and liquid manure on the fields.” Manure! And in not just one, but two forms! Really, I was overjoyed at the tedium and… “earthiness” this game seems to have been able to inject into what are usually fanciful farm fantasies. I didn’t stop there, though. I downloaded the demo and dutifully attempted both available missions, but like the RPS reviewer, I stayed on task for all of a minute before the constant warnings not to drive too quickly got thrown out the window and I started barreling down the highway at 40 miles per hour. Or was it kilometers? Sadly, the high point of my demo experience was discovering that the harvester actually made realistic warning “beeps” as I hit reverse, though perhaps there should have been some other, more drastic fail-safes given that I began trying to roll my hay baler over townspeople and boulders just a short while later (don’t worry, nothing happens to the people–this isn’t Grand Theft Combine). Dying to try it for yourself? Find the demo here. I honestly have to wonder at the commercial viability of games like these, but what do I know? I do wonder about the target market however. It seems unlikely to me that there are that many people who have an opinion on Krone or a Horsch tractors (assuming those companies make tractors, I have no idea) that don’t already own and use the farm equipment in real life. And is playing a game about what you do in real life that fun? I was going to theorize that not many people actually play games about their real life work, but I know too many counter examples to make that argument. The average player entering the NFL these days has far more football knowledge than rookies did 10 years ago, all because they have played thousands of virtual snaps in Madden, as opposed to a few hundred real snaps in their high school and college games – and a number of these guys are known to continue playing Madden during their career. I know several amateur pilots that don’t play any games other than extremely realistic flight simulators where they fly a route in real time – the 1 commercial pilot I know also plays flight sims, but rounds it out playing action games. Thankfully I am blissfully ignorant of any computer programming simulators, and wish to remain so.